So make sure to visit Celeb Dirty Laundry for our Celebrity Big Brother US recap between 8 PM and 10 PM ET. While you wait for our recap make sure to check out all our CBBUS recaps, videos, news, spoilers & more, right here! The road to the finally begins tonight. Lolo reassures Kandi that she was only put up on the block because nobody would vote her out over Tom. The doorbell rings and it is Mark McGrath from CBB1. He congratulates and tells the houseguests that he is going to celebrate with them over champagne breakfast. Mark asks what is the hardest thing about having roommates, they agree that is talking because you don’t know who is listening. They think back on a time when Nathalie goofed and started talking about a final two with Lolo and didn’t know that Tamar was in the room. Mark takes a look in their fridge and can’t believe how dirty and overcrowded it is. They start to talk about Joey Lawrence, he is probably the cleaning person they ever met and a lot of the mess in the house disgusted him. Tom called him a germaphobic, washing his hands every ten seconds. Next, they talk about Kato and how he thought he was funny, but he really wasn’t and one time Ricky offered to pay him if he made him laugh, and he didn’t. We take a look back at another argument with Tamar and Lolo oversee bass. The two clearly have problems getting along. Mark says that Joey and Ryan bonded really quickly. Ryan learned a lot from Joey, they ate together, they exercised together and sleep near each other. Ryan called Joey his peanut butter to his jelly. We look back on Lolo when she lost it with Ryan and Jonathan, she didn’t like that they were close together. We see Tamar and Kandi speaking about how they were on tour and had good times and bad times. When they first saw each other in the house, it was a little awkward. Now, the two are closer after being in the house together. 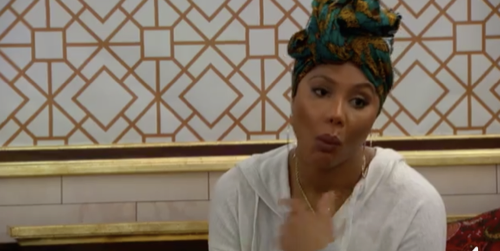 Another look back, this one when Lolo told Tamar that she was a virgin and Tamar’s response was, how would you know if you like the beach if you don’t play in the sand. Tom shared a personal thing with Ricky, he told him that he is a testicular cancer survivor. They caught it early, that was 20 years ago. He says it showed him not to sweat the small thing in life. Dina talks about how Ryan opened up about his Olympic experience, it was the hardest time of his life – he was loved by everyone and they hated by everyone. Ricky reveals that he has felt the same, sometimes his actions off the field upset his fans and turn them from loving him to hating him. Ricky says that the true role models are the ones that make mistakes and bounce back. Mark shares with the house that Tom used to stay up late at night and do whacky things. Next, we see various houseguest visits to the diary room. Mark leaves and it is time for the HoH competition. The houseguests walk out in the backyard and it feels like they are on Broadway. Melissa is there, she won last season if CBB, and she is a Tony award winner. In this competition, houseguests are going to star in a musical. When the horn sounds, they hit the buzzer to activate their magnetic puzzle board for twenty seconds, the goal of this competition is to fly like a bat while racing to make the bat the musical puzzle. The first person to complete the puzzle will be the new HoH.